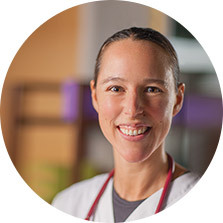 Stephanie is a registered nurse and macrobiotic counselor. She joined the Hackett Medical team part time to complete student clinical hours for her degree and joined full time in 2011. As a life long athlete, and later as an athletic trainer, Stephanie has always been focused on the role that nutrition plays in health and recovery. Her time at Hackett Medical has brought her attention to the possibilities for preventing and reversing chronic disease through diet and lifestyle changes and prompted her to complete an intensive Macrobiotic training. Stephanie cherishes the opportunity to walk with each patient along the path to health. Stephanie received her Master of Science in Nursing (MSN) from Case Western Reserve University, Bolton School of Nursing in 2011 and is certified as an adult nurse practitioner. Stephanie is currently on maternity leave after welcoming a beautiful baby boy at the end of 2015.